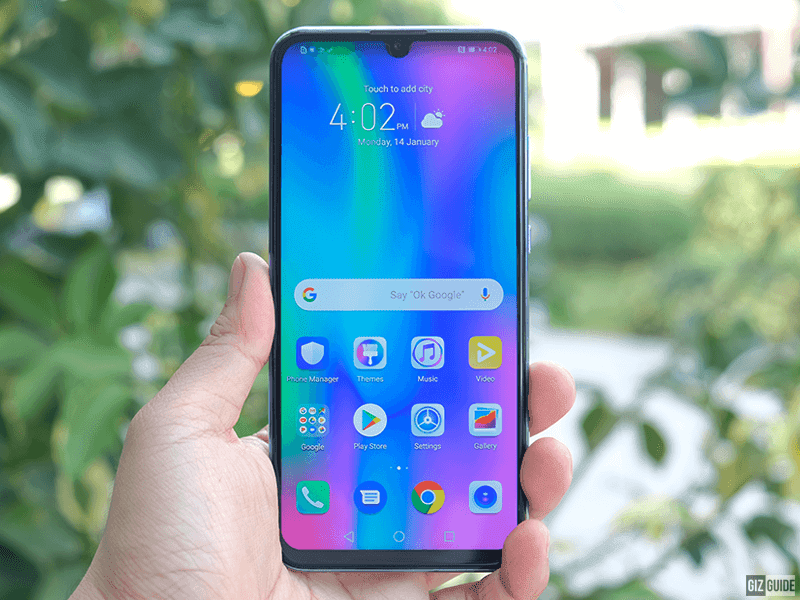 Right on schedule, Honor launched its latest selfie-centric smartphone in the Philippines, the Honor 10 Lite. As its name suggests, Honor 10 Lite is the more affordable sibling of the Honor 10. But, it is safe to argue that it is more stylish than its higher-end sibling. 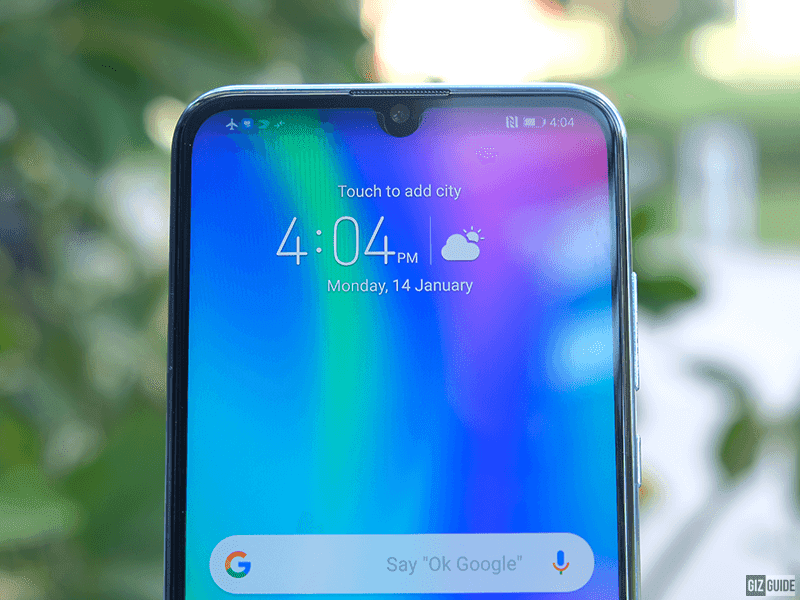 Honor 10 Lite boasts a gradient 3D glass-like back design with a 6.21-inch 19:5:9 screen with a small halo-like notch. 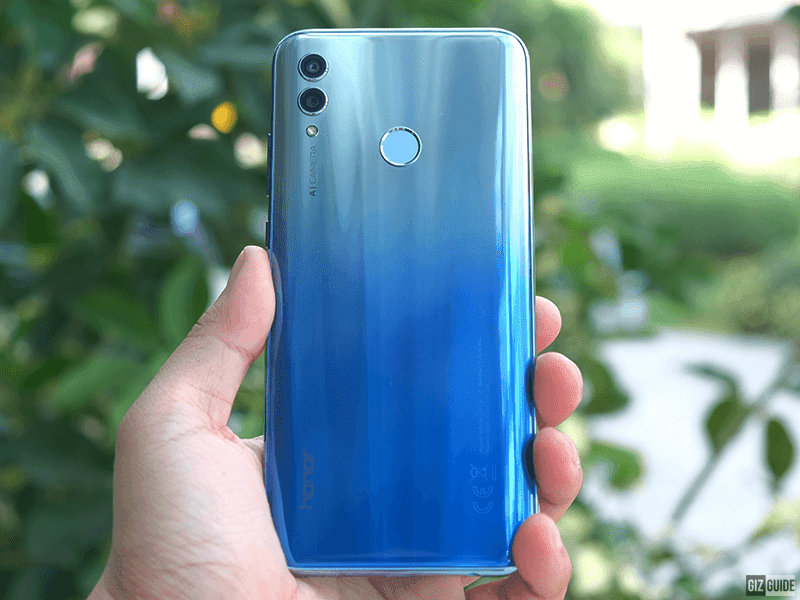 Honor claimed that it even has over 90 percent of screen-to-body ratio. It is also one of the few with a super slim chin. Inside, it is pretty powerful device as well. It is powered by the Kirin 710 octa-core processor, the same chipset found on the higher-end Nova 3i by Huawei. It even has the advantage on gaming as it has GPU Turbo 2.0 versus the GPU Turbo version 1 on Nova 3i. The device that we will get in PH is the 3GB RAM/64GB ROM variant. The 64GB storage is even expandable up to 400GB with microSD slot. Honor 10 Lite has a capable 13MP f/1.8 primary shooter with PDAF focus paired with a 2MP f/2.4 secondary sensor. What made it special is it has Master AI for portraits and scene detection. It can detect up to 22 different scenes. Moreover, it is currently the most affordable with an AIS Super Night Mode. This feature will allow users to shoot up to 6 seconds handheld long exposure shots for low light scenes. Watch: How to shoot stunning night shots with your Honor 10 Lite? The main highlight of this device is its selfie camera. It comes with a 24MP f/2.0 snapper with AI face beauty. Honor 10 Lite also comes with AI face unlock tech that works even in low light. It also has a fingerprint scanner at the back for added security. As expected the phone has WiFi, 4G LTE, Bluetooth, and dual SIM slots. It runs with Android 9.0 Pie OS w/ EMUI 9.0 skin out of the box. As of writing, this handset is one of the few with Android Pie out of the box. 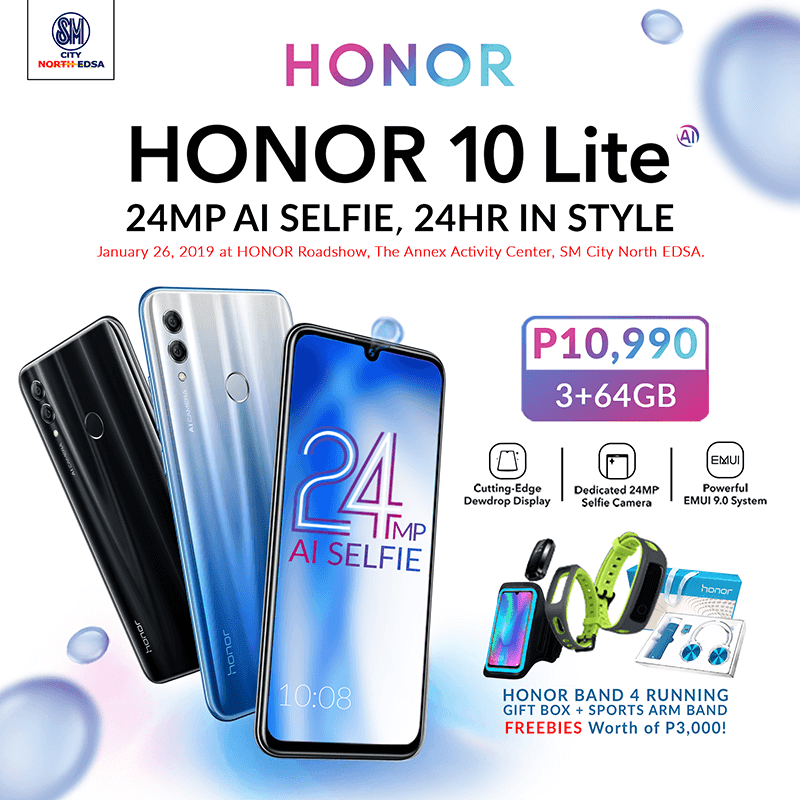 The first exclusive sale of Honor 10 Lite is on January 25 at Shopee with PHP 3,000 freebies. Regular SRP of Honor 10 Lite on Shopee is PHP 9,990. On January 26, the Honor 10 Lite will be available at SM City North EDSA Roadshow at the 4th level of The Annex Activity Center for PHP 10,990. Those who will buy the Honor 10 Lite from SM North EDSA in Jan 26 will get exciting freebies like Honor Band 4 Running, Honor Gift Box, and Honor Sports Arm Band worth PHP 3,000 in total. All of the customers who will purchase the handset at the activity center will also get a chance to win a Huawei Matebook Laptop thru an onsite raffle. Home Credit and Flexi Finance also has installment offers available during the event.